Located south west of Orlando around 30-45 mins, Fantasy of Flight Florida is a great day out for all those enthusiasts who love the history of aviation over the last 100 years. Also, it's a fantastic venue to visit away from the main theme parks over in Orlando. 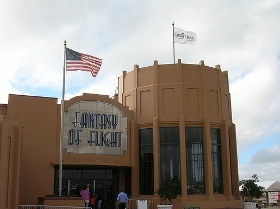 Fantasy of Flight owner, Kermit Weeks, announced in March 2014 that effective Sunday, April 6 2014, the venue will close to the general public. Scaled down museum operates seasonally from 11AM to 3PM Friday-Sunday. Please check calendar for more information. From vintage aircraft restoration projects and over 40 fully built (May I say priceless) displays of aviation history on show in their flight museum based in the authentic 1940's airport village....you will be nothing but impressed and well worth every dollar you spend! You will find tram tours around the restricted areas including the airfield and maintenance hangar. Ariel demonstrations by experienced pilots including Kermit Weeks himself. Fighter town, where you step onboard flight simulators and take off and land on the aircraft carrier USS Yorktown, and even for the young ones, a hands-on interactive area where they learn all about flying through building paper airplanes to a brilliant hang glider simulator. After all that excitement drop in at the Compass Rose restaurant and admire the Art Deco of yester-year and enjoy some really good food from a short-order menu. See our link section below. Fantasy of Flight Florida might not be for everyone. We've noticed it's very popular with all air fanatics through out the world....Remember the location is around 30 - 45 mins from Orlando so transport is required check these links below for further information before you leave your hometown. Road map...Directions to find Fantasy of Flight Florida Located just off the I-4 at Polk City. Entrance Prices....Useful to know to pre-plan before you start your vacation..
Events....Fantasy of Flight is always buzzing with activity, hosting all kinds of events throughout the calendar year. Discount Tickets....Enjoy great savings for your day. Bi-Plane Rides....Carries 4 passengers onboard the New Standard D-25! Walk on Air....Heights of over 40 feet with 33 challenges plus 600 feet of screaming zip line! Dining....Step back in time at the Compass Rose restaurant! From a personal point of view, if you, your family or even friends love the history of aviation and want to see all this in its full glory we would highly recommend you visit Flight of Fantasy. We travel from the UK and are only comparison is the superb R.A.F. Duxford war museum which again is truly a magnificent day out....so go on, if you've got the transport pop yourself down to Polk City here in Central Florida! When you're planning your trip to Fantasy of Flight Florida, you don't want to use old news and information. We will keep updating our site via our RSS feed. Simply click onto the RSS feed above and follow the instructions. It's an easy way to stay on top of what's happening in & around Orlando, free of charge.